Please take a moment to read this important message. If you have questions or comments call the Rainwise Service Department directly at (207) 801 4039 between the hours of 8AM and 4PM Monday to Friday. This past summer and fall has been what we could call “The Perfect Storm” of events that caused a severe backlog of work. Summer and fall is typically always a busy time for our company and we were right in the middle of all that. Then we experienced unplanned immediate staff changes here at RainWise Inc., which resulted in us having to reassign other positions to cover the loss. After trying to keep up with the business of the season and catching our breath from the changes, the United States then had severe weather-related situations around the country (i.e., hurricane in Texas, hurricane Irma in Florida and surrounding areas, as well as many forest fires on the west coast.) As recent as two weeks ago here in Maine, our Governor declared a state of emergency because of hurricane gusts that came through doing substantial damage and causing extended damage around our state with trees down, power outages, road closures, etc. etc. This all combined created a massive increase of business to all departments here at RainWise Inc., mostly starting in the service department. Even though we had to do some internal shifting around at our office, some of the remaining people had scheduled vacations that had been on the calendar for months, and so we honored their requested time off, which would not have typically been a problem if all the above-mentioned things had not taken place. So key people were out for chunks of time that made the backlog worse. In addition to scheduled vacations some of those same key people experienced family medical emergencies this past summer and fall. At this point we were all in a bit of disbelief at all the situations that caused us to get so backlogged. Our current acting Service Manager, Ralph maintains a “under promise, over deliver” mentality when dealing with customers so out of necessity he starting to quote lead times on repairs as high as 8 to 10 weeks. Knowing that it most likely would be a bit less than that, he wanted to make sure the information we were giving to customers was accurate, as to not have unrealistic expectations. During this time, it certainly felt like we were fighting a losing battle and we were fully aware of customer’s needs. All the staff of RainWise rolled up their sleeves and dug in one day at a time, and did everything within our resources to get caught back up and see the light at the end of the tunnel. Today, November 15, 2017 I am happy to report that we are back on par. We are at the status that we were at before any of the above-mentioned things occurred. With winter arriving soon and “the season” winding down we feel as though business should resume as normal from here on out. We certainly appreciate all our customer’s patience and understanding during this time, and we sincerely apologize that we may not have been able to assist you in a timelier manner as we always have in the past. We hope that this “perfect storm” scenario does not happen again, but we believe if it does, we will be much better prepared. As always, if you have any questions feel free to contact our Service Department directly at (207) 801-4039 – We are typically here Monday thru Friday 8am to 4pm. **Just as a courtesy, we would like you to know our department will be closed Thanksgiving week November 21st to November 24th. RainWise Offices are open Monday – Wednesday that week. This entry was posted in news, weather stations and tagged customer service, Rainwise, troubleshooting, weather stations on November 17, 2017 by Dan Olmstead. What are degree days and why do we use them? Degree days are an important part of many NEWA tools, but what are they and whey do we use them? Insect and plant development is controlled by temperature. Warmer temperatures speed development while colder temperatures slow development. This relationship can be used to track the life cycle of an insect or plant with something called a degree-day model. A degree day is a unit of measurement that is species-specific and represents some proportion of overall insect or plant development. Degree days are calculated by using maximum and minimum temperature to calculate a daily average, then subtracting a base temperature. 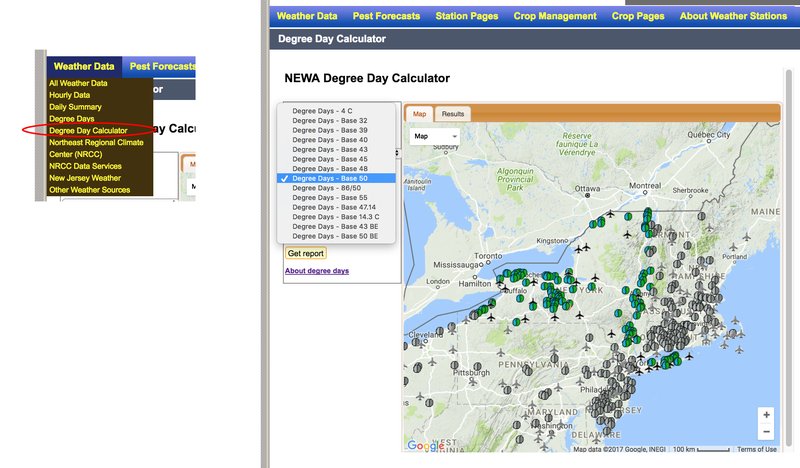 NEWA weather stations provide daily temperature information to track pest development, and the rate of degree-day accumulation is unique for each location. 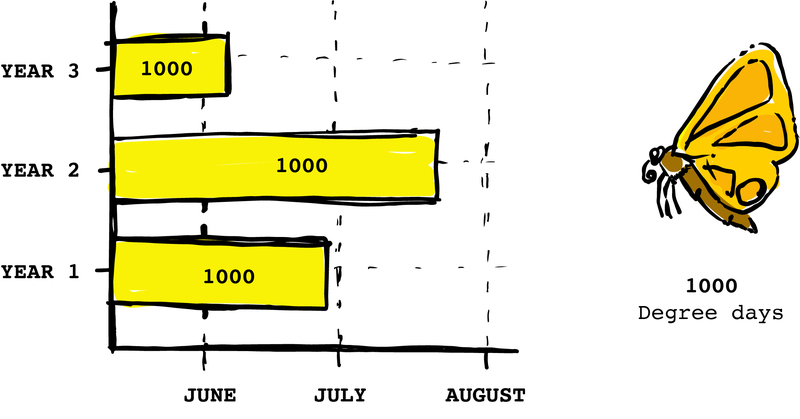 It also helps to think of degree days as accumulated points, not accumulated days. Different insects have a different degree day requirements. This caterpillar pest has a base temperature of 50 degrees Fahrenheit (or 10 degrees Celsius) and a developmental requirement 1000 ‘base 50F’ degree days from egg to adult. 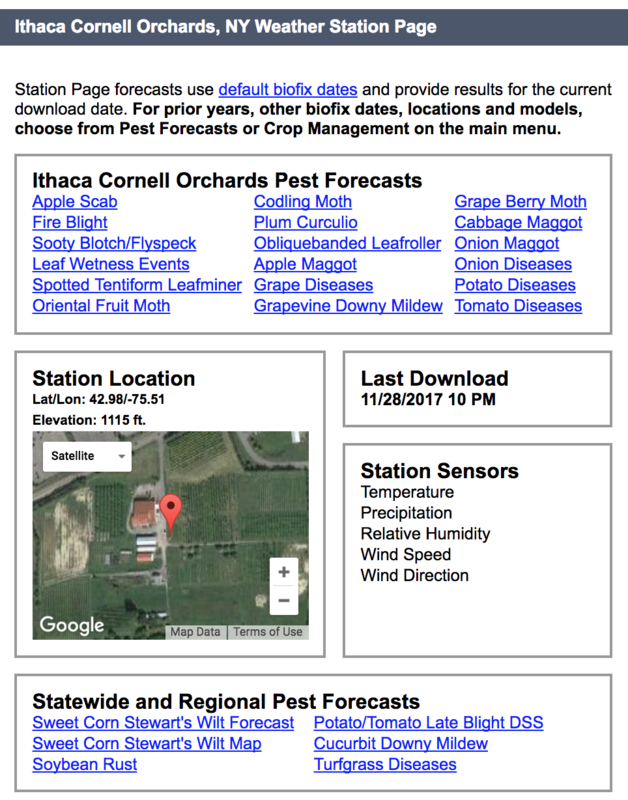 Image Copyright Dan Olmstead NYS IPM Program. For a long time, pest management information learned from our parents and grandparents was accurate. But now, the weather is less predictable, especially in the last five or ten years. (And new pests have emerged.) Sadly, cross-generational knowledge is becoming less reliable. 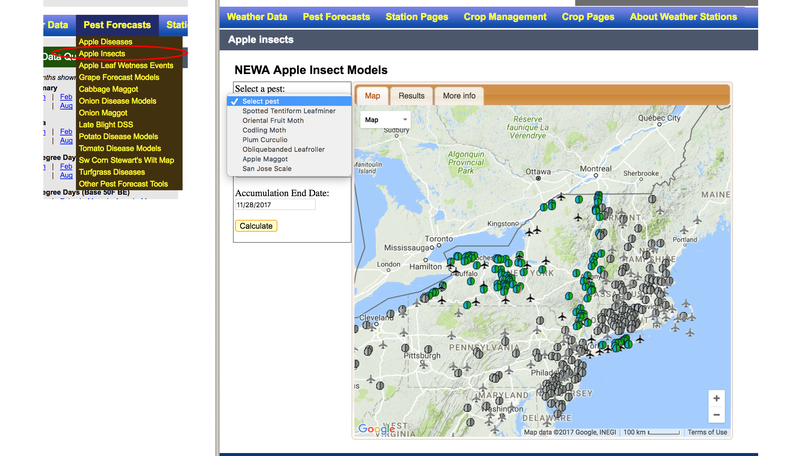 Degree-day models are now the best basis for agricultural pest management decisions. A farmer is going to see changes in pest pressure, planting time, or crop development from one year to the next. Degree-day models, combined with modern technology, give growers a better estimate of pest status. There is still variability, but he or she is better informed to make effective management decisions. Degree day requirements for an insect won’t change. But the time needed to gather those degree days is variable. Up next, we will take a closer look at degree day tools available on NEWA. This entry was posted in about models, Degree days, IPM, learning and tagged definition, Degree days, learn, NEWA, resources, tools on November 15, 2017 by Dan Olmstead.